If your dream is to play college sports, do you know what you have to do to make it happen? Whether you’re hoping to play in Division I, Division II, or Division III, you need a plan to ensure success. Every plan should start with well-defined goals. 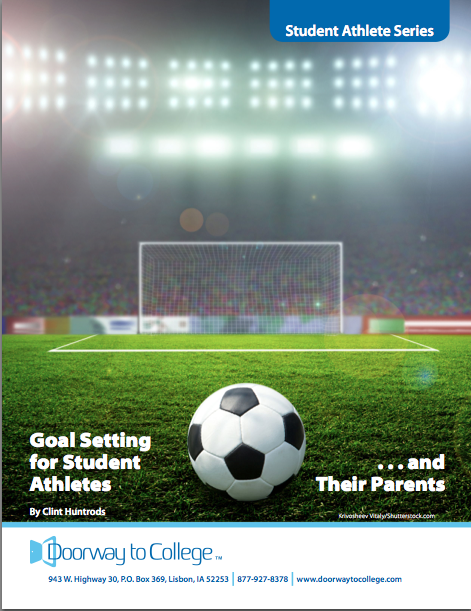 This booklet is the first in the Doorway to College Student Athlete Series, designed to help high school students and their parents through the exciting (and challenging) process of preparing to play college sports. Fill out the form below to download the first e-book in the series: Goal Setting for Student Athletes … and Their Parents. But don't stop here! Check out the rest of the e-books in the Student Athlete Series by going to www.doorwaytocollege.com/studentathletes. There's a lot more to learn about getting ready to play college sports — and we're here to help you. Yes! Send me the free e-book — Goal Setting for Student Athletes ... and Their Parents.